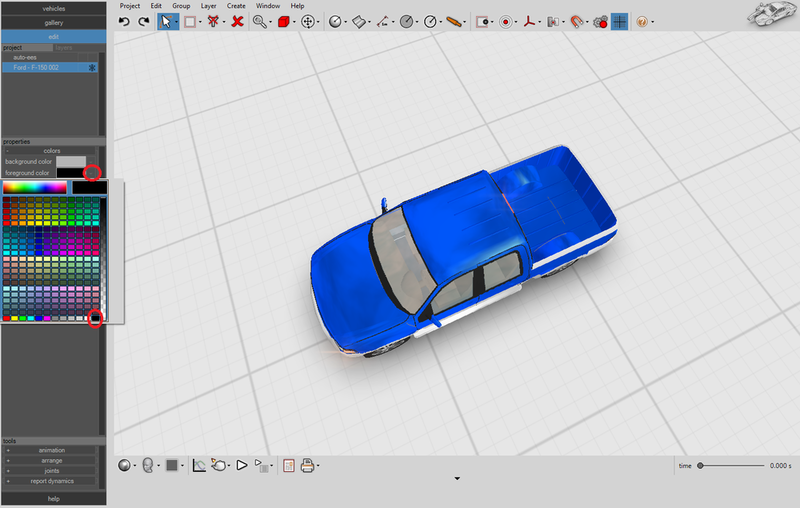 I’m trying to manipulate my vehicle’s polygon mesh by moving its vertices, but all of my vertices are red and I can’t determine which ones I’m selecting. How can I fix this? This is likely caused by accidentally changing the “foreground color” option in the properties menu. This is easy to fix. To fix this, first go back to object selection type [Shift+O]. Next, left-click away from any object in the scene in order to reveal the properties menu shown below. Another way to access this menu is to left-click on your vehicle, then freeze it in the project menu. Now, you’ll probably notice your “foreground color” is red. By default, Virtual CRASH sets this to black, however, users have the option to change this color. When in vertex selection mode, an object’s vertices will be displayed using this foreground color. Once selected, vertices change to the “selection color”. If both the foreground color and selection color are the same, then you will have difficulty determining which vertices have been selected. Simply set the foreground color to black. Now, unfreeze your vehicle, go back to vertices selection type [Shift+V], and you should now see your vertices appear black. When you select vertices from your model, you’ll see the selected vertices appear red and those not selected appear black. The ability to change the foreground and selection colors can be useful in some instances. For example, when a vehicle is either black or red, it can be difficulty to see which vertices are selected and which are not. In the example below, we’ve changed the foreground color to white to more easily see those vertices that have been selected versus those that have not. Tags: background color, foreground color, selection color, vertices, object, change vertex color, vertices color, selection color, color of vertex.